Pt100, Pt1000 and NTC are the most-used measuring elements in resistance thermometers. I would like to use this blog to consider the question of connection types in greater detail. Resistance thermometers change their electrical resistance as a function of temperature. This physical effect makes it possible to measure the temperature of a process with a Pt100. The resistance is determined by electronics (e.g. temperature transmitter) by using a constant current and measuring the voltage drop. According to Ohm’s law (R = U/I), the resistance [R] and voltage [U] are proportional to each other at a constant current [I]. There are three possible ways to connect the Pt100 to the transmitter: in a 2-, 3- or 4-wire connection. With a 2-wire connection, the resistance of the cable is added as an error in the measurement. 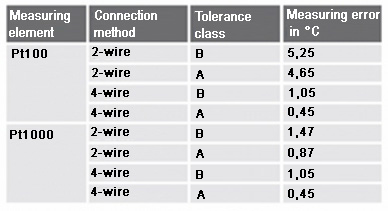 For a copper cable with a cross-section of 0.22 mm2, the following guide value applies: 0.162 Ω/m → 0.42 °C/m for Pt100. For a version with Pt1000 the influence of the supply line (at 0.04 °C/m) is smaller by a factor of 10 in relation to the basic resistance. The lead resistance becomes still less significant in relation to the basic resistance R25 with an NTC measuring element (e.g. R25 = 10k). Due to the sloping characteristic curve of the NTC, the influence at higher temperatures increases disproportionately. The influence of the lead resistance is compensated to the greatest possible extent with a 3-wire connection. The requirement for this is that the lead resistances are the same, as can be assumed with a 3-wire connection. The maximum length of the connection lead depends on the conductor cross-section and the compensation options of the evaluation electronics (transmitter, display, controller or process control system). The 4-wire connection completely eliminates the influence of the connection lead on the measuring result since any possible asymmetries in the lead resistance of the connection lead are also compensated. A further possibility to substantially decrease the influence of the cabling is to increase the conductor cross-section. With a cross-section of 0.5 mm2 the line resistance is only 0.036 Ω/m or 0.1 °C/m. Both options (3/4-wire connection or increasing the cross-section) lead to a higher cost in the cabling, which can be problematic, especially in cost-sensitive markets such as machine building. As a compromise between cost and accuracy, for smaller cable lengths, a class A, 2-wire connection Pt1000 measuring element can be offered. The highest measurement accuracies are only achievable with a Pt100 in a 4-wire connection. A Pt1000 measuring element in class A also offers good measurement accuracies in a 2-wire connection and represents an economical alternative to 3- or 4-wire connections for machine building. Further information on resistance thermometers can be found on our website.